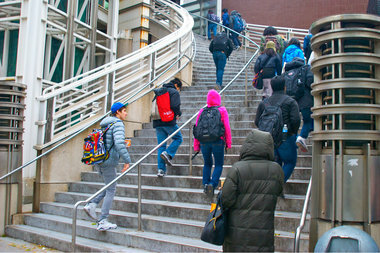 Students entering Stuyvesant High School in Lower Manhattan. MANHATTAN — The city's elite high schools aren't going to get any more diverse next school year, after the Department of Education admitted an overwhelmingly Asian and white group of students to the schools this week. Just 5 percent of the students admitted to the eight schools that require the Specialized High School Admissions Test were black and 7 percent were Latino, according to DOE data. The exact same percentage of black and Latino students were given offers last year. Overall, about 41 percent of New York City public school students are Latino, 26 percent are black, 17 percent are Asian and 15 percent are white, according to DNAinfo New York's analysis. In contrast, the students admitted to the city's specialized high schools for next fall are 52 percent Asian and 28 percent white. The lack of diversity in the city's top high schools has inspired fierce scrutiny and debate over the admissions criteria. City and state officials are mulling a variety of policy changes in hopes of boosting racial diversity at these schools. These include a bill in Albany that would allow Stuyvesant, Bronx Science and Brooklyn Tech to use multiple criteria — like test scores, grades and attendance — instead of basing admissions on a single test. "It’s critical that our city’s specialized high schools reflect the diversity of our city," Schools Chancellor Carmen Fariña said in a statement. "We continue to review a variety of ideas to increase diversity at our specialized high schools such as increasing access to the SHSAT, offering expanded free test prep and continuing to examine changes to admissions policies." Stuyvesant accepted just 10 black students this year (up from seven last year) and 20 Hispanic students (down from 21 last year). The Queens High School for the Sciences at York College extended offers to the fewest number of black students, with just four (down from last year's 14). Staten Island Technical High School had the lowest number of offers to Latino students, with just four (down from 19 last year). Using criteria beyond the test, however, would not necessarily improve the schools' diversity, according to a report from the Research Alliance for New York City Schools released Thursday. The report simulated the effects of the proposed admissions changes and found that the number of black students admitted to specialized high schools could actually decrease under several of the proposals. "While there is a clear pattern of unequal access at the specialized schools, our findings suggest that a narrow focus on the SHSAT is unlikely to solve the problem," said the report's author Sean Corcoran, associate professor of educational economics at NYU’s Steinhardt School of Culture, Education, and Human Development. The disparities, he said, were "symptomatic of larger, system-wide achievement gaps." More than half of the students admitted to the top-tier schools came from just 5 percent of the city's middle schools, the study found, but it wasn't the middle schools themselves that affected the likelihood of getting in. Rather, it was a student's achievement prior to that, which means that changes to boost diversity may need to begin when children are younger, the researchers said. All told, across the broader high school system, about 48 percent of eighth-graders were matched to their first choice school and 76 percent received one of their top three choices, DOE officials said. Approximately 8 percent did not receive a match in this first round. All high school students can participate the second round of admissions and have until March 21 to submit applications. Offers will be sent out in May. For Round 2 of admissions, the DOE will host fairs for students on Saturday and Sunday, March 14 and 15, from 11 a.m. to 2 p.m. at the Martin Luther King, Jr. Educational Campus in Manhattan, 122 Amsterdam Ave., at 66th Street.